The Pirate Bay and several other pirate sites are unavailable again in many parts of the world, due to a new blockade from Internet backbone provider Cogent. The site's IP-addresses, which are owned by CDN provider Cloudflare, have been blackholed, in what appears to be another case of over-blocking. Last month, news broke that Cogent, which operates one of the largest Internet backbone networks, blackholed IP-addresses that were linked to several ‘pirate’ sites including The Pirate Bay. As a result of this action, people from all over the world were unable to access their favorite download or streaming portals. 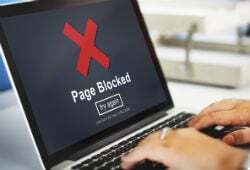 The blocking intervention was quite controversial, not least because the IP-addresses in question don’t belong to the sites themselves, but to the popular CDN provider Cloudflare. After the mysterious blocking efforts were first reported, we found out that Cogent acted in response to a Spanish court order. This compelled the company to block the IP-addresses in question. Ironically, many of the popular pirate sites were not the direct target, but collateral damage simply because they shared the same IP. In response, Cloudflare moved The Pirate Bay and other ‘innocent’ sites to a new set of IP-addresses, so they became accessible once more. Cloudflare’s General Counsel Doug Kramer further informed us that they worked together with Cogent to prevent similar over-blocking issues in the future. “We have taken technical steps on our end to permit Cogent to comply with a court order issued to them without additional impacts,” Kramer informed TorrentFreak. Despite this promising collaboration, however, Cogent has now blocked Cloudflare’s new IP-addresses as well. This effectively renders The Pirate Bay and other sites such as TorrentProject, Icefilms, Torlock, Popcorn-Time, Movie4k and 1Channel inaccessible on its network. Cogent has blackholed the IP-addresses 104.31.16.3 and 104.31.17.3 which are all shared by these sites. This is likely another case of over-blocking, unless there is a new court order listing all the sites on these IP-addresses. TorrentFreak reached out to Cloudflare to find out more about the situation, but at the time of writing we have yet to hear back. The Cogent episode is not the first time that innocent Cloudflare customers have been affected by a court order. Previously, UK ISPs blocked several websites because they shared an IP-address with The Pirate Bay. Last month, Cloudflare’s General Counsel cautioned against broad blocking orders. If they are issued by judges who don’t fully understand the effects, these could affect a wide range of sites which they are not intended for. “It’s important for courts to understand how Internet systems work so they can write orders that don’t end up having unintended consequences,” Kramer stressed at the time.